Simon Russell Beale, Ben Miles and Adam Godley portray multiple characters in The Lehman Trilogy, about the rise and fall of Lehman Brothers. The Lehman Trilogy, which opened at the Park Avenue Armory in New York City on March 27, has been produced in France, Germany and Italy. An Italian, Stefano Massini, wrote it; the Englishman Sam Mendes directed it. And yet the story is quintessentially American. Three Orthodox Jews from Bavaria arrive in New York in the mid-19th century; eventually two of them settle in the very neighborhood where the play is being staged. And over the next decades, they build one of the most influential economic behemoths in the world: Lehman Brothers. That financial powerhouse emerged from modest beginnings. The eldest Lehman brother, Henry — played with an earnest, commanding presence by Simon Russell Beale — arrived in New York in 1844 and headed south, to Montgomery, Ala., where he opens a general store. His observance of the Jewish Sabbath turns out to be an asset: His shop, which then sells cloth and garments, is closed on Friday evening and Saturday, but open on Sunday, when most establishments are shuttered but customers are pouring into town to attend church. Henry's brothers, Emanuel (played by Ben Miles) and Mayer (Adam Godley), join him in Alabama, and they seize upon new opportunities to grow their business. They start selling products farmers need to grow cotton, like rakes and seed. Then they sell the crop itself. When Emanuel takes a trip to New York, he is smitten with the city, a place he describes as "completely shameless and completely sublime." It will become the extended Lehman family's home. From there they will trade coffee and oil, finance railroads and airlines, and wade into film production (they were behind hits like King Kong and Gone with the Wind). 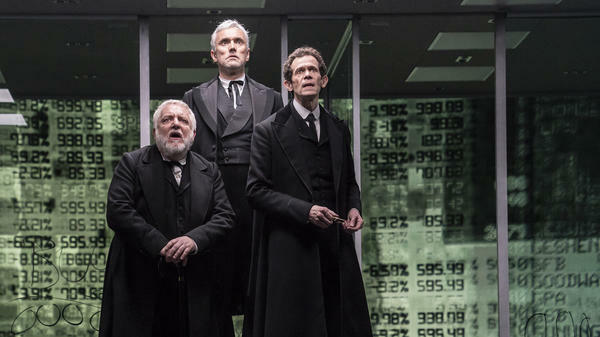 In a talk at the Armory, director Sam Mendes described how the original staging of The Lehman Trilogy featured a dozen actors. He eventually whittled the cast to the three men, who collectively play some 70 characters, and these transformations occur with no costume changes. Modulating their bodies and voices, they become women, children and decrepit old men. Beale's turn as a dyspeptic rabbi schooling the independent-minded 9-year-old Herbert Lehman — who would grow up to be a legendary New York senator and governor — is one of the comedic highlights of the play. And Adam Godley's literal dance to the death as Bobbie Lehman, the last member of the family to helm the firm, is riveting. At the production I attended, audience members spontaneously broke into applause as he sank into the floor. The play does not delve into the collapse of Lehman Brothers in 2008, which sent off economic gyrations around the world. The insinuation is that the bank's shift from investing in actual products and industries to focusing on pure financial machinations led to its demise. It is perhaps a testament to the power of the storytelling that even though the implosion of the firm happens in a rushed 20 minutes, it doesn't detract from the play's emotional heft. The writing is lyrical: The newly-arrived Henry describes the bustle that greets him when he gets off the boat as "the magical music box called America." When Bobbie Lehman creates a trading desk, one of the older Jewish investors visits the room where men yell out numbers and stocks, and ruefully remarks on how far the firm has evolved away from "velvet and cuff links." What stands out most in this production are the troika of actors. They are almost never absent from the stage during the nearly 3 1/2 hour production. They were collectively nominated for the Olivier Award for Best Actor, the British equivalent of the Tonys. That seems fitting, because working together — dressed in stark costumes, with minimal props — they manage to make worlds come alive. Alexandra Starr, a frequent NPR contributor, is a Spencer fellow at Columbia University.